Shinoa Hiragi is Guren's sergeant and one of the squad leaders of the Moon Demon Company. She is appointed to supervise Yuuichirou during his suspension from the Japanese Imperial Demon Army for his reckless behavior. She is sarcastic and enjoys teasing others, especially Yuuichirou. Her Demon Weapon is Shikama Douji (四鎌童子, lit. Four-Scythe Child), a manifestation-type demon weapon which takes the form of a large scythe, but can be condensed into a pen-like object. She can call out the demon, which she fondly addresses as "Shi," inhabiting it out of the weapon to attack an enemy. Her primary ability is to detect anything that comes within the attack radius of her scythe. 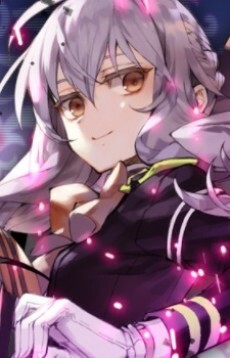 Despite being a member of the distinguished Hiragi family, Shinoa is uninterested in their internal power struggle. Moreover, due to her sister's legacy she is generally shunned by the upper echelon of the army. However, she is loyal to Guren and to the members of her squad. A childhood lacking in familial warmth left Shinoa with little understanding of the importance of friendship and camaraderie. She is moved by Yuuichirou's unwavering loyalty to the members of his squad, who he considers his family, and wants to foster the same feelings for them herself.